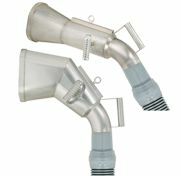 Steam vacuum hock cleaning systems specifically designed for microbial reduction and the removal of contaminants. •The HS-1and HS-2 are specifically designed for microbial reduction and the removal of contaminants from front legs (HS-1) and rear hocks (HS-2). •Increases yields – less trimming required. •Vacuum systems sized specifically for your requirements.